ND Filter or neutral density filter is a filter that reduces the intensity of all wavelengths of light without changing the color. It allows to use a wider aperture. ND filter is basically a single piece combined glass or plastic plates of optical quality, which is screwed before the lens of the camera to achieve uniform darkening of the image. Gray filter / ND filter are also used for movie camera. It is homogeneously colored neutral gray, so the color reproduction is not distorted. 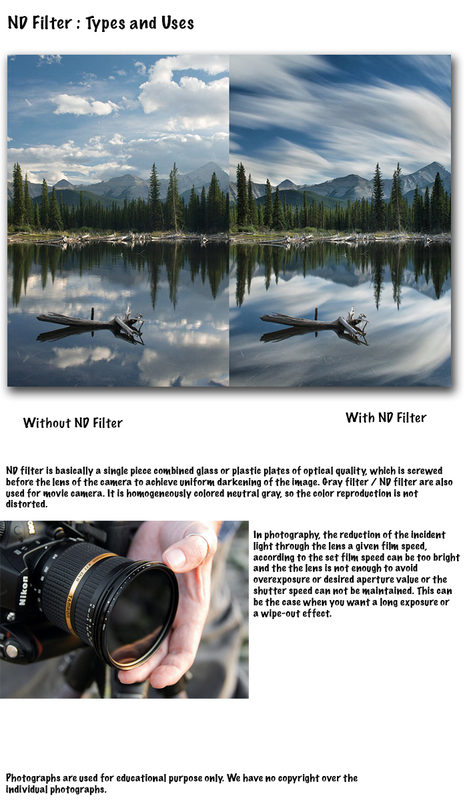 Standard types of ND filters have a Filter factor of 2, 4 or 8; (filter factor refers to the multiplicative amount of light a filter blocks) the ND filter gets the designation “ND 2X”, “4X ND” or “ND 8X”, on their body. ND filter also expressed as NDX Filter (Neutral Density) or ODx (optical density), where x is specified with a trailing number. When the large “X” is missing and the factor name is indicated with a decimal, for example in “ND 3.0”, then this indicates to the logarithmic scale by the following damping formula : The strength of the attenuation calculated from the logarithm of the ratio of the incident intensity and the intensity measurable by the ND filter. There is table that shows the common names of NDX (in logarithmic scale), the indication of ND, X (x-fold prolongation of the closure time, in linear scale) and the number of stops around which the amount of light decreases. ND 0 corresponds to no filter effect, polarizing filter lying around is ND 0.45 and 8.0 represents a weakening of the intensity by a factor of 10 = 100,000,000 8th. Alternatively, ND2 is named as Half , ND4 is Quarter and so on. The transition area, is available with different variations like soft, hard, attenuator. The most common is a soft edge and it provides a smooth transition from the ND side and the clear side. Hard edge grads have a sharp transition. A basic practical idea can be understood from our guide to Long Exposure Photography with Neutral Density Filter. This is a guide for fine tuning a particular usage. In photography, the reduction of the incident light through the lens a given film speed, according to the set film speed can be too bright and the the lens is not enough to avoid overexposure or desired aperture value or the shutter speed can not be maintained. This can be the case when you want a long exposure or a wipe-out effect. Movement of falling water photographically requires 1/60 sec exposure time or longer. The light is too so bright and / or the film speed required is so high that despite the smallest possible aperture for the correct exposure on a given lens can not be adjusted, a ND filter is used instead. Especially in architectural photography, disturbing peoples or vehicles moving in front of the building do not get blurred out. Also you can extend the exposure time so that the threshold of the used neutral density filter is below the level to create any change on the sensor / film and the persons or vehicles in the image are not visible. This Article Has Been Shared 5175 Times! How to Hold a Digital Camera really depends on the camera you have, the type of lens, your physique and also whether your hands are large or small enough. 7 key points to master the portrait photography says how to get a closeup photograph of the face of a person as it should be – naturally. How to Take Beautiful Photograph of Doors – Perhaps reading the title of this article making you to think what is so interesting in doors to make them worthy subject ? Cite this article as: Abhishek Ghosh, "ND Filter : Types and Uses," in The Customize Windows, July 26, 2013, April 21, 2019, https://thecustomizewindows.com/2013/07/nd-filter-types-and-uses/.